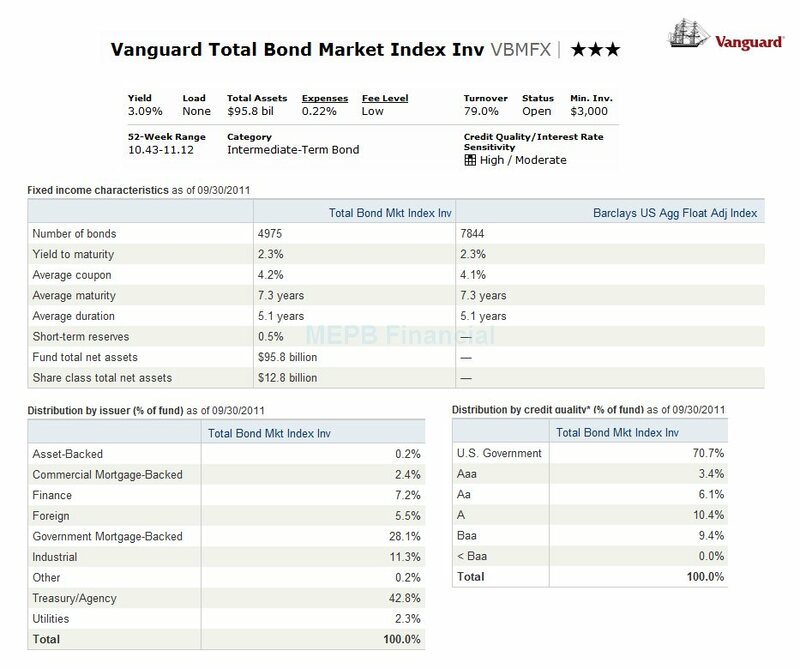 Vanguard Total Bond Market Index fund (VBMFX) is a popular taxable bond mutual fund. This Vanguard bond fund provides a decent yield. You will find the fund review in this article. Vanguard has been well known with its wide selection of mutual funds. It also among the leader with low cost index funds and exchange traded funds (ETFs). One of the most popular Vanguard’s bond index fund is Vanguard Total Bond Market Index fund. Please check the fund’s review below. This Vanguard Total Bond Market Index fund objective is to provide return by tracking the performance of Barclays Capital U.S. Aggregate Float Adjusted index, the bond index. The fund invests >80% of assets in bonds held in the index. This Vanguard fund keeps a dollar-weighted average maturity consistent with that of the index, ranging between 5 - 10 years. Kenneth Volpert was the fund manager before. This VBMFX fund has an expense ratio of 0.22% / year. This no load fund doesn’t have a 12b1 fee. The dividend yield is 3.12%. The last dividend was distributed in September 2011 ($0.03). The fund’s effective duration is 5.2 years, and the fund’s average maturity is 7.4 years. Investor can buy this Vanguard fund with only $3,000 for regular brokerage account and for retirement (IRA) account. This fund requires $100 for the minimum subsequent investment. You can find and buy this fund from 83 brokerages, such as Vanguard NTF, TD Ameritrade, Firstrade, Morgan Stanley, JPMorgan Invest, Fidelity, etc. The other class of this fund is the Admiral Shares (Ticker: VBTLX), Institutional Class (VBTIX), Signal Class (VBTSX), and ETF (Ticker: BND). The expense ratio of VBTLX is 0.11%. 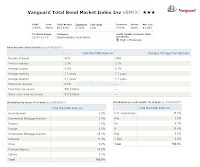 This Vanguard Total Bond Market Index fund is rated with 3-stars rating by Morningstar. The highest achievement within the 11 years of performance was in 2000 with 11.39% and the lowest achievement was in 1999 with -0.76%. This VBMFX fund has 6.57% YTD return. It has returned 6.35% over the past 5 year, and 5.23% over the past decade. According to the fund’s prospectus, the Principal Investment Risks are: Interest rate risk, Credit risk, Income Risk, Call Risk, and Index tracking risk.